Only LED Bed on the market to offer full body treatments and focus on facial applications simultaneously. 24,000 LEDs make it one of the most advanced & powerful LED Therapy Beds on the market today. More Power, Switchable Wavelengths at a fraction of the price. LIGHTWAVE’S flagship ELITE panel can step up the full body experience by including an esthetic treatment simultaneously. This panel has received 5 FDA clearances for Firming, Wrinkles, Acne, Pigmentation and Pain. Topical Light Infusion is proprietary technology combining LED light therapy and powerful topicals that dramatically diminish fine lines and wrinkles, discoloration and inflammation while improving the overall appearance of the skin. LIGHTWAVE LED Therapy has been leading the way and setting the standards for Professional LED light therapy systems for 16 years! Red & Near Infrared Low Level Light has been proven effective in over 4,000 Clinical Studies. The ENVY Light Capsule stimulates the entire body in one treatment utilizing Stimu-LED diode technology. The Capsule targets more problem areas, faster than ever before. Utilizing 24k StimLED™ diodes to insure proper output combined with our PureLED™ Technology. Our technology has received multiple clearances, backed by significant scientific data, years of field service and a commitment to excellence. Dual LCD Touchscreen from inside the capsule or out. Control and customize your treatments with beautiful simplicity. Patented Multi-Wavelength Platform makes it possible to address a variety of skin conditions ranging from fine lines, discoloration, flaccid skin, and dermal repair to acne and PDT treatments all in one system. Other LIGHTWAVE and other LEDt/PBM devices have been previously cleared and all of our systems address a variety of skin conditions for the entire body plus our LED systems have 5 FDA clearances – Wrinkles, Firming, Acne/PDT, Pigmentation and Pain. 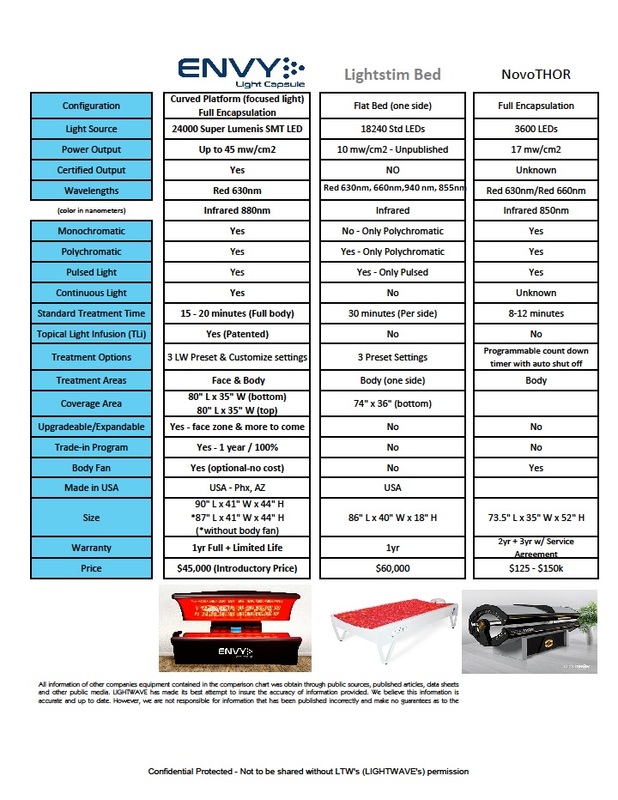 Why is LIGHTWAVE LED Therapy a leader in light therapy technology? Monochromatic (1 color at a time). Clinically proven and no destructive interference. 1 Year 100% Trade-in/Upgrade guarantee. Actual Shipping Costs will apply $750 - $1000. Non Refundable Once Shipped. Installation and Training Cost not Included $1200- $2200. License Required for Facial Add on and Topical Light In Fusion Products and Use. Click the button below to add the Envy Red Light Bed without Facial Add On to your wish list.